One beautiful sunny morning last week, with that kind of drowsy promise of a scorching (by UK standards) afternoon on it's way, we decided to head out foraging before it got too hot and all our quarry wilted. We packed up a bottle of water and some snacks into Ollie's backpack, I removed the spare clothes from mine since we surely wouldn't need them so close to home and just carried nappies, wipes and baggies. Off we went, the kids eyes shining with the excitement of the adventure into the tiny strip of woodland near our house. 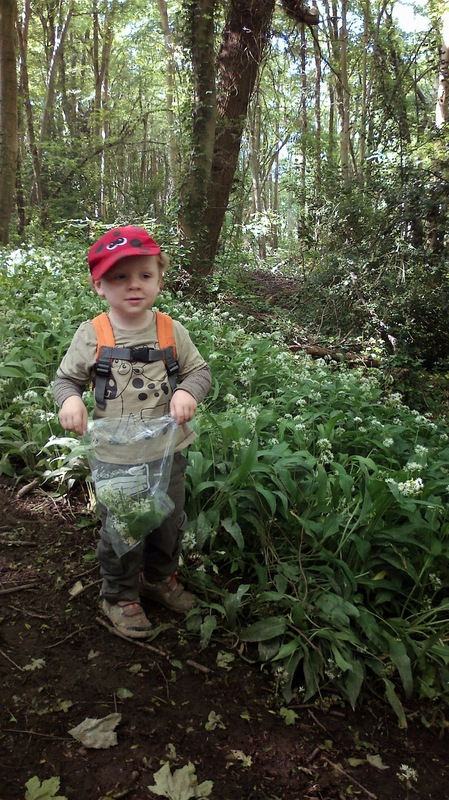 We found heaps of wild garlic straight away and I set the boys the challenge of picking the nicest, cleanest, greenest leaves they could find. Ollie picked carefully and proudly showed me the 'bestest leaves' that he'd picked. 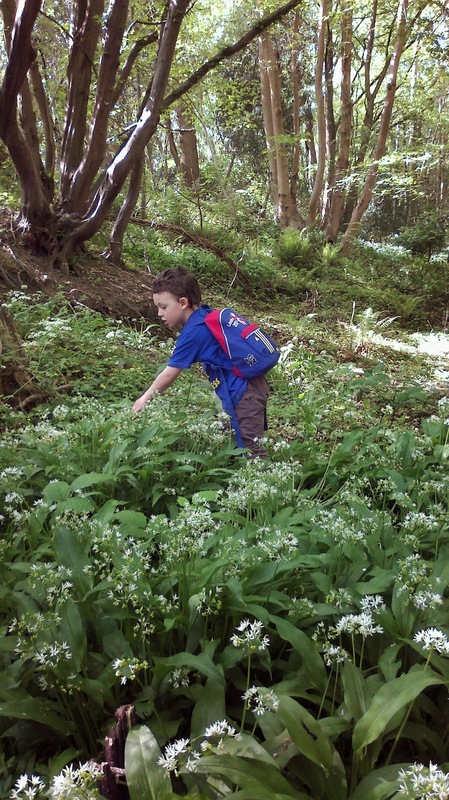 Toby picked equally carefully but preferred the white garlic flowers to picking leaves. Then we had our first minor disaster as Ollie ran along the path and fell over, right onto a protruding root and bruising his hip. Commence the first barrage of crying (Ollie can be quite a toughy, but this one really hurt). I applied a dob of 'magic cream' (a tin of lipsalve), Toby gave Ollie cuddles and off we went again. We walked further along the path, and as Ollie was calming down we stood in a patch of sunshine with our eyes closed and breathed and listened to the birds ecstatic chorus (and the nearby road, and the scary sounding light aircraft that kept flying around overhead). We ducked under one fallen tree, watched butterflies lazily dancing over the flowers, then found another fallen tree blocking our path. This was perfect for climbing over, and was a bit bouncy so we sat on it gently bouncing. Then second minor disaster. Ollie hadn't noticed that something had left a smelly present on the log. It was all over his hands, up his arms, over his t-shirt and his jeans. I had left that change of clothes at home. Doh! Wet wipes and a baggy came to the rescue, but we decided to head home to change. There was a second round of crying as Ollie was not happy about being covered in poo and having to leave the woods 'but I haven't been here for a long time' he wailed. We had been there recently, but that was not what he meant. Off we stomped, recovering the situation enough to marvel at an ermine moth that the boys found on a fence on the way home. Then minor disaster number three when Ollie somehow managed to stab himself with the stick he was carrying, grazing his neck. More tears. We got in, clothes straight into the washing machine, kids straight into the bath, antiseptic wipe applied to grazes, clean outfits on, breathe all is well again. 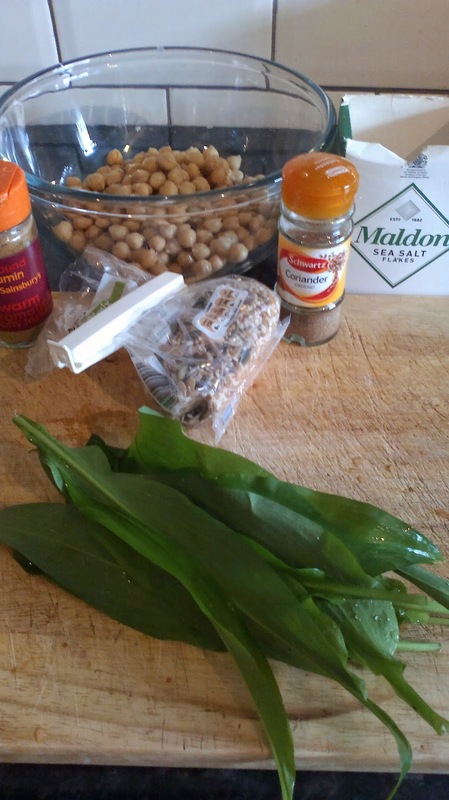 We used the wild garlic to make my version of falafel. I carefully washed and shredded the garlic. The kids helped me mush up two tins of chickpeas with the blender, to which we added the garlic, a teaspoon each of coriander and cumin, a pinch of salt and a tablespoon of mixed sunflower, pumpkin and sesame seeds. We patted them into small patties. I shallow fried the patties for a couple of minutes each side then banged them into a hot oven for 20 minutes. I made a salad to go with our falafel and toasted some pitta breads. I took the falafel out of the oven for the final minor disaster of the day - when I tried to lift the falafel from the oven tray they completely smooshed. So we had a delicious dinner of chickpea and wild garlic smoosh in pittas with avocado salad. Not winning any prizes for beauty, but the plates empty at the end of dinner, which is pretty much my only measure of the success of a meal. I wanted to write this not to put anyone off going outside, having adventures, cooking with kids or any of the other things I advocate. I just wanted to say that sometimes things go a bit wrong, but that's ok. If we spend all our time idealising about this amazing experience we're expecting because we saw it in a magazine we can give ourselves a hard time when reality isn't like that. So yes, sometime poop will (quite literally) happen, but it's not the end of the world and so long as we've packed the wipes, maybe some hand sanitizer, if you're super organised some spare clothes too, then it's all pretty quickly fixed. It's so good for a parent's mental state. I don't know if I'd have dealt with it all with patience and good humour if I hadn't spent time first just breathing in the woods, smelling the smells and filling my brain with birdsong instead of the incessant demands of my own little chicks. As for the kids, they forget the poop and just remember the brilliant time they had having an adventure with you. Note, foraging is loads of fun, but if you're not completely certain what something is, don't eat it. Follow your local advice and laws regarding what and where you can pick. Drum it into your little folk not to put anything in their mouth that they haven't showed you first, or that you have given to them. use your best judgement for when your kids are ready to go foraging because they can follow this rule. Organised groups are a great way to get involved in foraging with an expert to give you peace of mind, and gut, that you're not picking anything unsavoury. Usual common sense - you know the drill.